The Carbon Hold foundation stabilization system utilizing the exceptional strength of carbon fiber to hold the wall in place. Carbon Hold exhibits high strength to weight ratio. 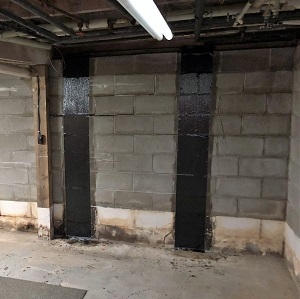 The Carbon Hold system is also an effective crack repair method because it helps stabilize the wall during future basement wall movement, preventing the crack from widening. 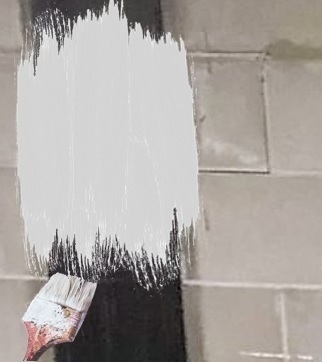 The Carbon Hold system can be used as a crack repair method on almost any concrete wall. The Carbon Hold crack repair method can also be easily painted over. If a carbon fiber repair is going to fail, it is most commonly due to the failure between the epoxy bond and the foundation wall. The Carbon Hold system is a 12 inch wide mesh that has a substantial surface area to bond to the foundation wall. This creates a stronger bond than almost any other system and lessens the potential of the epoxy bond being pulled off of the foundation wall. Unlike solid fiber, the mesh allows the epoxy to penetrate through the Carbon Hold strap, allowing the epoxy to act like tiny rivets bonding the whole system to the foundation wall. The Carbon Hold system will bond to the concrete wall. The Carbon Hold crack repair method seals, strengthens, and stabilizes leaking cracks, in conjunction with the injecting the crack with the epoxy crack repair system. It provides structural integrity to the crack and gives homeowners the peace of mind that the crack will not leak again due to wall movement.